Carrom Game is a table-top game played by locals in Mauritius. 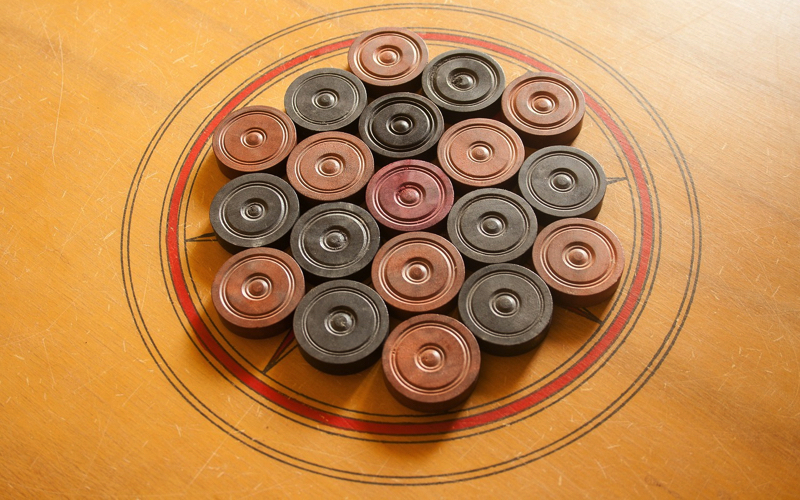 To play you use a striker disk and with a flick of the finger you move lighter object disks called Carrom men. These men are propelled into one of four corner pockets. The striker and Carrom men are similar to the cue ball and object ball in cue sports such as snooker or pool. The aim of the Carrom game is to pot your nine carrom men and the queen before your opponent pots his. 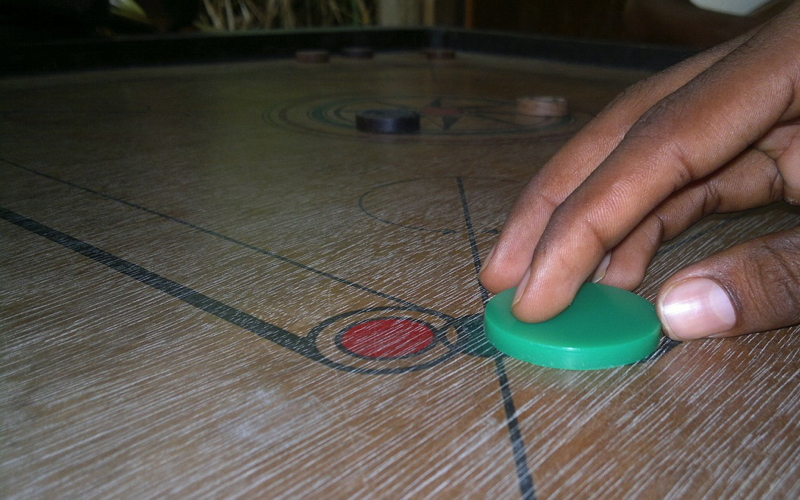 Carrom Game is played on a board that is 74cm square and usually made of plywood. Carrom men are made with a smooth surface so that thy slide easily when they are laid flat on the board. A Carrom set will contain 19 pieces in 3 different colours. Two colours represent the players’ pieces and one colour for the queen. To setup the Carrom game the queen is put at the centre of the circle. Putting the queen into a pocket and then one of your men, is known as covering the queen. The player must pocket the queen and subsequently pocket a carrom man of the player’s own colour. If a player puts a Carrom man of the opposition in the pocket after “pocketing” the queen, then the queen has to be placed back in the centre of the board. If the player fails to pocket a subsequent Carrom man, the queen is replaced back at the centre of the board. If the player pockets his or her opponent’s last carrom man before pocketing the queen, then it is considered a foul. If a player puts the queen and a carrom man of the player’s own colour in the pocket with one use of the striker, the queen is automatically covered, no matter which went first. A successful pot entitles the player to go again. The player can shoot with any finger including the thumb. Crossing the diagonal lines on the board by touching it, or pocketing the striker is a foul. A player needs to ensure that his striking hand does not infringe or cross the diagonal lines aerially or physically. A player committing a foul must return one carrom man that was already pocketed. If a player pockets his striker, he has to pay a penalty. This penalty is usually 10 points. Once the queen is covered, whoever clears all their carrom men first wins the board. There are variation of the Carrom game played throughout Asia, but it is a game you may well so locals playing as you wander around Mauritius.